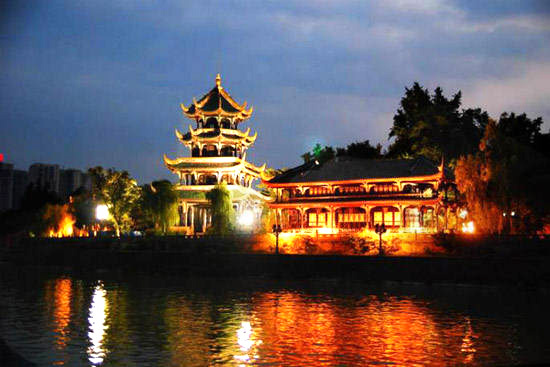 Covered with luxuriant forests and bamboo groves, Wangjiang Tower Park is next to the bank of Jinjiang River and encompasses an area of 120,000 square meters (30 acres). 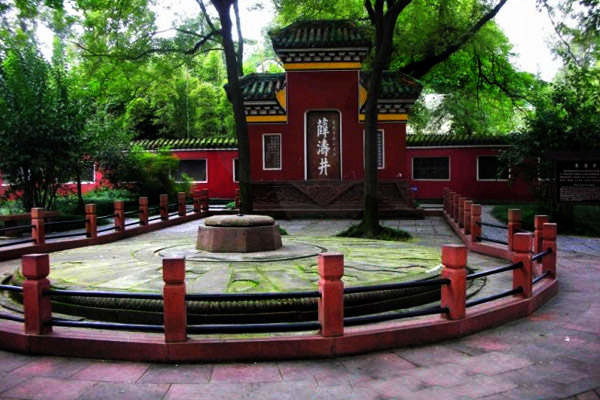 It is a historic site established in dedication to the memory of Xue Tao, a female poet of the Tang Dynasty. Xue Tao was versatile and beautiful. History records that she wrote 500 poems and that her contemporaries greatly admired her. Because of her love for bamboo, over 150 kinds were imported from other countries or gathered from the four corners of China and grow here in her honor. Wangjiang Tower is the most exquisite building in the park. 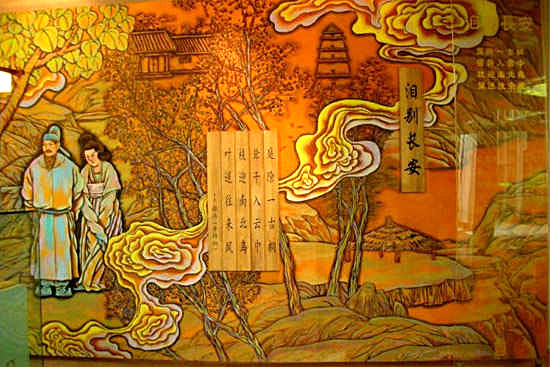 Traditional painting in the park. 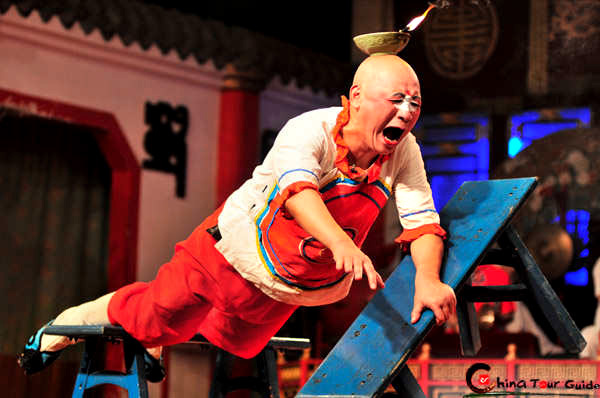 The most exquisite and magnificent structure in the park is Chongli Pavilion, also known as Wangjiang Tower. 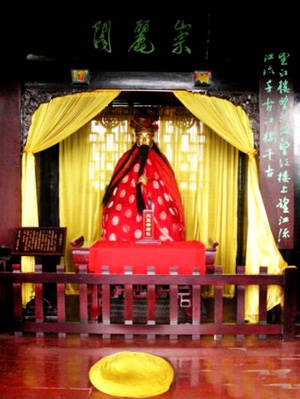 It was reconstructed during the late Qing Dynasty and has four stories with a total height of over 30 meters (100 ft.). It is beautiful with a square upturned eave on the two lower stories and an octagonal eave on the upper two stories, vermilion columns, glazed tiles and gilt cupola. 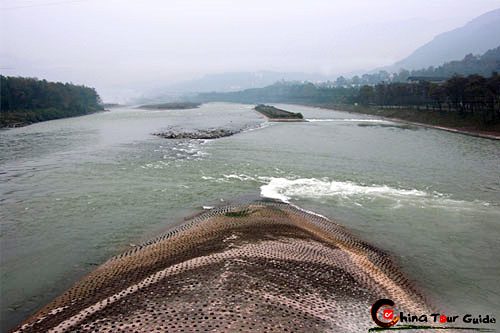 It stands by the side of Jinjiang River, hence the name "Wangjiang" (Overlooking the River). 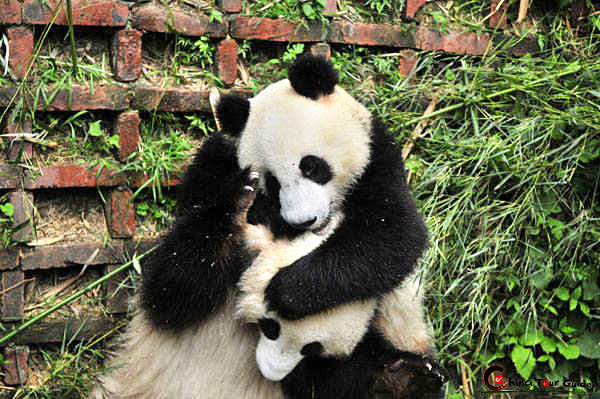 Surrounded by nature and a window to the past, it has become a symbol of Chengdu. Interior of the Chongli Pavilion. 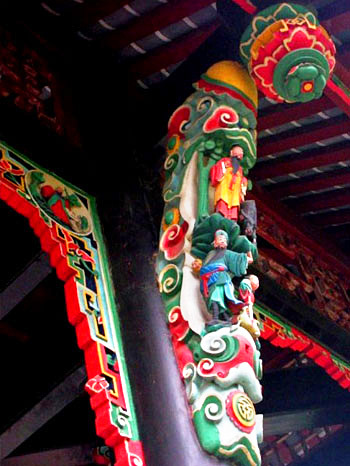 Well decorated column is made of wood. 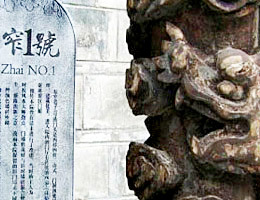 The tomb of the poet Xue Tao. 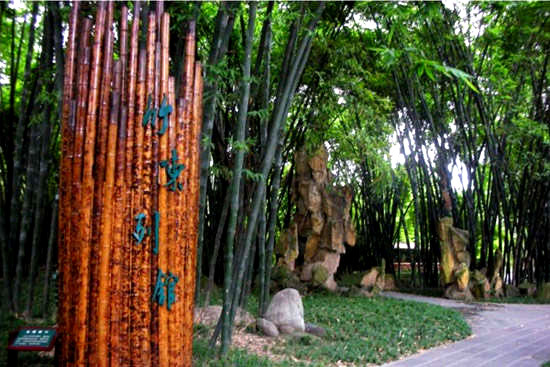 Wangjiang Tower Park is full of bamboo groves. Yinshi (poems-chanting) Building was built to replicate the tower Xue Tao lived in. With spacious rooms on the inside, and the river and dense bamboo groves and willows on the outside, it is no wonder that she was inspired with so many elegant poems. The setting for writing is perfect. The group of memorial buildings has been elegantly laid out, featuring Sichuan-style gardens, such as Wuyunxian (five fairy clouds) Hall, Quanxiang (fragrance of spring) Pavilion, Pipa (loquat) Alley, Qingwan (refreshing and pretty) House, and Huanjian (paper-washing) Pavilion. These house a large amount of steles, paintings, calligraphy, inscribed couplets and poems.